If you’re looking to go DIY for your next project, here are five essential paint accessories to use! When it comes to painting your home, having the right tools for the job is one of the most critical steps. While the tools that professionals use vary person-to-person, there is some overlap in favorites. Here we’ll go over five of the most common paint accessories that you want to have on hand for your next painting project. Finding a highly effective masking tape can mean the difference between clean, straight lines and damaged walls or ceilings with lines that bleed into each other. 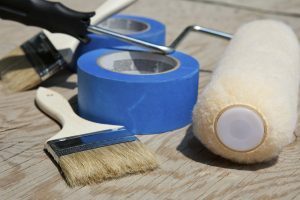 Depending on the job you’re working on there are several types of painters tape you can use. Some have a lower tack level, which makes them suitable for use on fresh paint. Some tapes are explicitly made for edges so that your lines will be clean, make sure to choose the right type of tape for your project. For a quick and easy cleanup process, nothing beats a cotton sheet for paint protection. The lightweight barrier is perfect for protecting furniture and carpets from any dust, dirt, or paint you kick up in the process. Not to mention, they are less slippery than plastic sheeting which makes them safer to walk on. Cotton dust sheets are also reusable, which makes them a great option if you are concerned about being sustainable. While the self-adhesive film can be slippery and must be discarded after every use, it has its own benefits. For newer painters who are more likely to spill and drip plastic will protect your flooring and furniture far better than absorbent cotton. The self-adhesive film also sticks to surfaces better, meaning you don’t have to worry about it moving around while you’re repositioning ladders and paint cans. A paint comb is a tool used for cleaning your paint brushes once you’ve finished. These important tools are inexpensive, but they help remove all the paint from deep inside your brush. This is great for making sure your brushes last longer. Angled brushes with a two to three-inch width are one of the most common tools for professionals. These brush’s bristles are cut at an angle so that it is easy to paint delicate areas like corners and trim carefully. If you have an intricate paint gob one inch angled brush might be the perfect way to paint all the nooks and crannies easily.